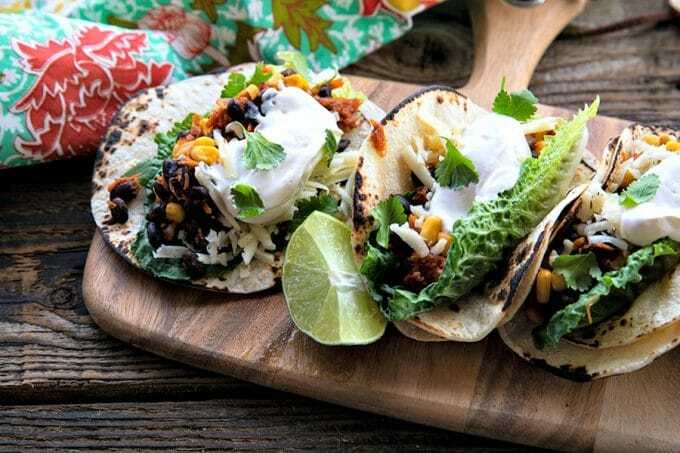 Today’s Black Bean Tacos are a lightning fast, super fresh, and divinely delicious vegetarian meal that cooks up in under ten minutes. HELLO LOVELY! I can’t say that Black Bean Tacos lack meat because they lack nothing; they’re just right as they are. What they are -and I realize this is semantics- is meat free. This recipe fits the bill in more ways than one. Let’s cover the health bases first because they’re impressive. Black beans, corn and carrots are in this recipe. All three on their own are good for you, but put them together and you have a powerhouse of fiber, protein, vitamin A, carotenoids, antioxidants, alpha- and beta-carotene, phytonutrients, calcium, magnesium and potassium. Phew. I feel better just typing that. In short, it’s heart, eye, digestive, immune and circulatory system approved. Beat that. Now let’s talk about WHY you need a recipe like this in your regular rotation. BECAUSE IT’S GOOD AND FAST AND CHEAP. I’m sorry to yell, but honestly… I’m serious here. 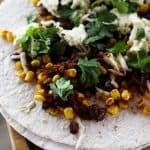 Is a black bean taco recipe expensive? We all get the kitchen funk every now and again. It’s recipes like these that save our budget and lift our spirits and make everyone happy. Even with my big family, we can all eat our fill from a double batch of this and it costs us less than $10.00 for the whole meal. Let’s break that double batch cost down for proof, shall we? This takes my estimate for the meal to a whopping total of $9.57 for a double batch WITH leftovers from a family of seven. If you have a smaller family, or are cooking for yourself or a couple, you could cut that in half right away and be looking at an under-five-dollar meal! I used home cooked, frozen beans but you could just as easily use canned beans (as was specified in the original recipe on CampbellsKitchen.com). Either way, the entire thing is done in less than ten minutes. That makes this last-minute snack worthy. I say this because you WILL crave it. And you WILL want these for game day or Super Sunday or late night snacks. And you want to know something? You don’t even need to think twice about whipping up a batch of these because they’re so good for you! Good golly. We are looking at a meal that taste incredible for a price that is so low it’s barely believable AND it comes together in under ten minutes to boot. That puts this meal squarely in Unicorn Meal* territory along with this slow cooker honey sesame chicken and this other favourite Slow Cooker Cuban Pork but *GASP* it’s even faster to make! Heck. You can even scoop this Black Bean Taco filling over the Best Baked Potatoes for a vegetarian taco tater. *Unicorn Meal: That elusive meal that is made at unbelievably fast speeds, pleases everyone, and is budget friendly. Hard to find, impossible to forget. What do you all think? Will you give it a try? Share your favourite unicorn meal. We’re all in this together! 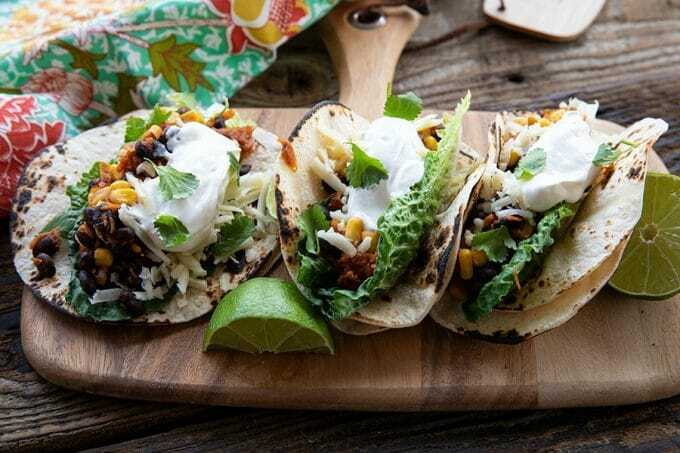 This recipe is really a no-brainer, but there are a couple of items to touch on including whether to use home cooked black beans or canned ones. Either will work. If you’re watching your sodium intake, you may want to opt for the home cooked ones as a way to have complete control in that area. I prefer the home cooked ones for texture (and I actually DO add quite a bit of salt, but still CONTROL!) 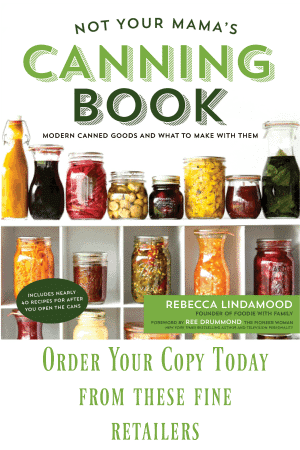 but for those nights when we are in a wicked hurry, the canned ones are a great substitute. Just be sure to drain and rinse either choice. I like my carrots to be super finely shredded for these tacos. The easiest way to do this is to hand the carrot and the box grater to whichever kid is closest at hand. The FASTEST way, however, is to put it through the finest grating disc on the food processor. I like how the super fine shreds almost melt into the taco filling and bulk it up. If you prefer, you can shred them on the standard side of a box grater though. It’s just a personal preference thing. Can we talk salsas for a bit? Homemade salsa is always going to trump the stuff from the store in my book. Here’s a great, 5 minute restaurant style salsa that wallops the dang out of many store bought alternatives. That’s right. Homemade salsa in 5 minutes and dinner with that salsa in another 10. You’re such a domestic superhero. 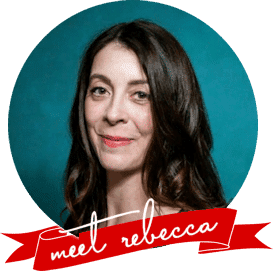 It is strictly optional to line your tortillas with lettuce leaves, but I like to use whatever little romaine or leaf lettuce leaves are lingering around the refrigerator to help make them tidier to eat. I also like the little bit of texture the lettuce lends. Scroll down for the full printable recipe. Spray a stainless steel (or other not non-stick) saucepan or small frying pan lightly with the vegetable or olive oil cooking spray. Set the pan over medium heat and let it get hot for a minute before adding the carrots and chili powder. Stir well and often and cook until the carrots are tender, about 2 minutes, depending on how coarsely shredded the carrots are. Add the salsa, black beans, and frozen corn. Stir, reduce the heat to low, and cook until the beans and corn are both hot all the way through and the corn reaches desired tenderness, about 5 minutes. If desired, top each tortilla with a lettuce leaf. Divide the bean and corn filling evenly between the tortillas, then do the same with the cheese. Scatter fresh cilantro (or parsley) leaves over the top. Serve warm or at room temperature. fresh cilantro leaves or parsley leaves or shredded lettuce. See Notes. If desired, line each tortilla with a lettuce leaf. Divide the bean and corn filling evenly between the tortillas, then do the same with the cheese. Scatter fresh cilantro (or parsley or shredded lettuce) leaves over the top. Fold in half, then in half again to form a triangle. Serve warm or at room temperature. The original recipe calls for shredded lettuce and sour cream. While you can certainly substitute the lettuce for the herb, I prefer the burst of freshness that cilantro or parsley provides. By all means, add sour cream if you want. I like it just as well without (or with Greek yogurt) and it keeps the price down. If you have it on hand and want to use it, though, it will taste wonderful! This post was originally published January 7, 2016. Updated in February 2019. Yes please!! I’ll take 3! I am making these tonight…..have leftover homemade tortillas from this past weekend. Meatless Tuesday? My family loooves tacos. 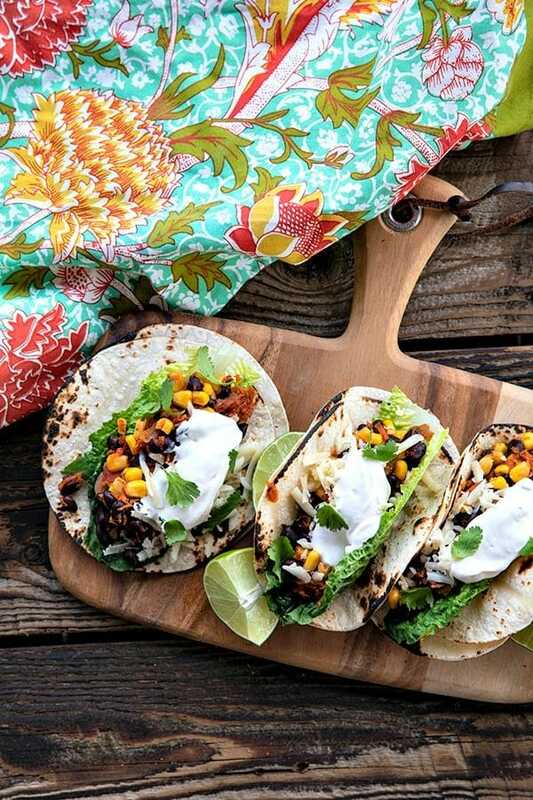 We make them street style with corn tortillas some meat, chopped onion, cilantro and a bit of guac. I’ve never met a taco I didn’t like and these are no exception. The cilantro scattered on top is making my mouth water!! Add in some sliced avocado and it will push it to over the top status. Making these tonight. They look delicious and WW points friendly too. We made these tonight, they were yummy. Next time we will add avocado or maybe onions. I love the unicorn concept! Will most definitely be trying this out. My husband: “Is there meat in it?” Me: “Yes, there is plenty of protein in it.” These are tasty, filling, cheap, fast, and have been a staple in our meat-loving home of 6 for the last two years. I love the taco. They were like my favorite dish ever. I like the way you added your creativity in it. Thanks for sharing with us. A lemon loaded Taco is my fave route thing I want every day in my meal. Thanks for the recipe dear. It seems to be very yummy. I will add some more ingredients in it and will try it in my own style. Thanks for sharing with us.